The crowded interior descended into darkness and as if from some far off ether, a singular point of light emerged. It blossomed into the projected image of a woman dancing; yet the image hadn’t not found home on a screen rather cascading and sliding across the walls, ceiling and bodies all present for a one night only, inaugural event by Global Committee held at the Garis & Hahn Gallery in New York. 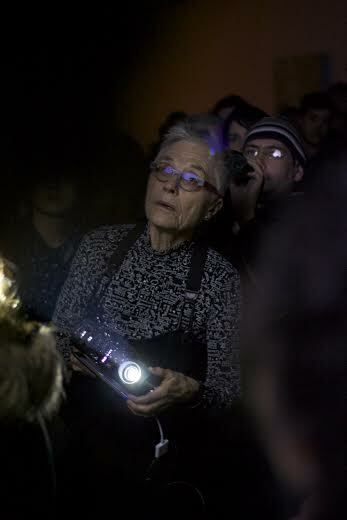 At the helm of the moving projector was Barbara Hammer, provocative and legendary queer filmmaker who presented her work “Available Space” in Body2Body, the off-site launch of Global Committee a new Brooklyn based, nomadic arts space. 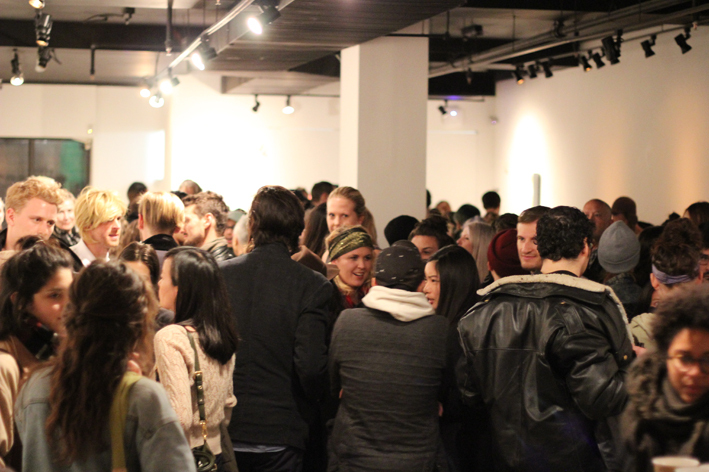 Hammer shuffled through the crowd projecting her film on the floor, faces of visitors and windows of the gallery, trailing behind her a host of guests hungry to see more. The questions raised included; How do we move, what do we move towards and how do we move in relationship to the moving image? Barbara Hammer’s work invites these inquiries through her careful manipulation of form and expectation. Watching her work is to step outside of time, to become transfixed by movement and desire, both within your own body and within the ‘body’ of her work. Everything floats away as you get lost in a sea of swirling visuals. As the performance drew to a close, she passed off the projector to an assistant, instead stalking the gallery with a butcher’s knife while she rapped, chanted and sang about our need for social liberation. Ultimately she arrived at a paper screen where her film was being projected and lifting a butcher’s knife high, stabbed, cut and sliced the screen until tattered, torn and eviscerated it falls, shredded to the floor. Perhaps the resonance of an artist stabbing a screen is a fitting image for Global Committee’s Body2Body event as a whole. Specifically in the context of the age of digital intimacy, when the body has been disqualified as the primary tool through which we experience the world, the screen has emerged as the gateway to experience. The entire night was curated so that the art presented constantly asked us to challenge our relationship to our own body, and more explicitly our relationship to our ‘digital’ body. How do we perform the authentic body in the context of the moment, when we know it is being presented towards a future screen? In exploring these questions around bodies and digital intimacy, Body2Body brought together disparate artists and mediums, intentionally blending form and format in an attempt to trouble the structures of the contemporary gallery scene, creating an engaging and unexpected exhibition. In addition to work by Hammer, the night included a screening of the short film, “We Know We Are Just Pixels” by Turner prize-winner Laure Prouvost, a performance of “The Heart Wants What The Click Wants” by Laura Cooper & Ian Giles, along with a plethora of video, installations and live performances by Jeremy Hutchison, Stephen Kwok, Shana Moulton, Molly Lowem Andrew Norman Wilson, Ann Hirsch, Juliana Cerqueira Leite, Jenna Bliss and Cupcake. Prouvost’s film “We Know We Are Just Pixels” was an unexpected counterpoint to Hammer’s piece. Rooted strongly in the digital apparatus, the short film itself, speaks directly to the viewers, exploring and explaining its unique relationship to time, confinement and desire. It is utterly haunting. Quick editing, jarring visuals and bold text merge to create the unseemly feeling of being watched by the machine, especially as the film reaches its climax and begins to self-reflexively question its own ‘immortal’ digital body as it relates to our decaying flesh. Within the specific context of this exhibition, as well the films questioning of how digital and human bodies caress each other, altered how I found myself moving through the space. In the presence of so many people, all of whom were busy taking selfies, recording the performances and posing for pictures, one could not help but wonder what futures lay in store for the versions of our selves that were captured and made digital over the course of this evening. Also in dialogue with correlation between the digital and the body was “The Heart Wants What The Click Wants” by Laura Cooper & Ian Giles. This piece involved somewhere between 10 – 15 performers (it was hard to keep track of them), who wandered the gallery listening to a pre-recorded audio track on their musical devices. I had the pleasure of listening to some of the piece and it involved ethereal music inter-spliced with a series of commands, which varied from breathing exercises, to movement commands. Yet what made the piece so arresting is how it brought the idea of the digital world so palatably into the gallery space. 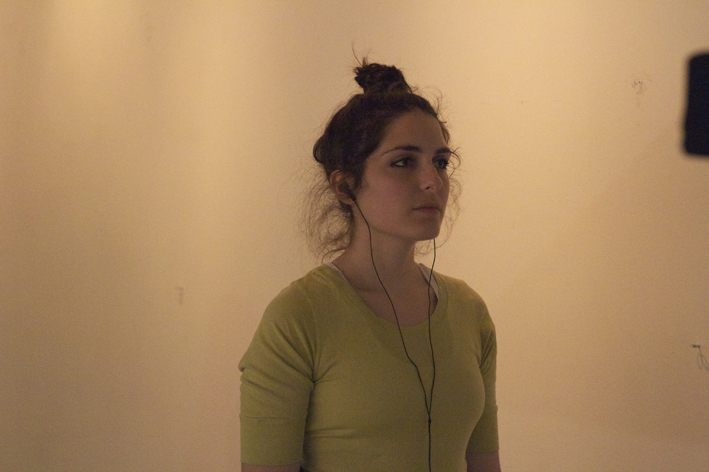 We are so accustomed to people listening to music on their headphones while out in the world, and transposing that action to the gallery, the performers became embodiments and reminders of the blending between the digital and the human in our everyday life. Furthermore any time any one reached for their phone or plugged in their headphones as they got ready to head out into the night, the line between performer and patron began to blur and all interactions blended into this space of digital performance. In Body2Body, the dimensions of what is performance and what is gallery space where challenged. We became the screen for Barbara Hammer’s projections. 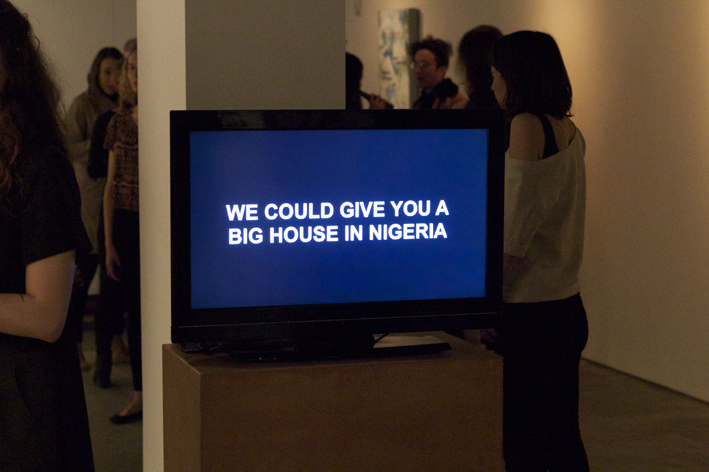 We were an immortal future audience locked in a dialogue with our decaying flesh through Laure Prouvost’s film. Laura Cooper & Ian Giles turned us all into digital performers asking us to challenge how we perform with and through our devices. 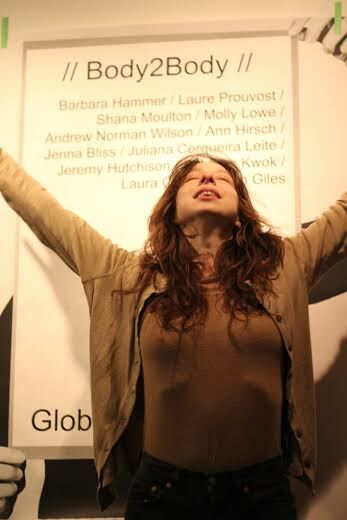 Yet for me, the real magic was how in curating this event, Global Committee was able to fill the gallery space with friends and lovers and art enthusiasts, until we all were pressed body to body, indulging ourselves in moments of glorious intimacy, both digital and physical.